Now that we know the Halloween (a.k.a. the Treehouse of Horror) update will be released on October 1, 2013 we have some time to prepare. It is highly likely that this will be a social event, so make sure you have enough friends so that you can get the most out of this experience. 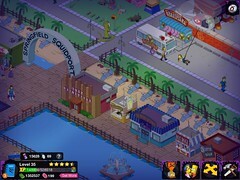 Last year I was too shy about letting people see my Springfield, and without neighbors I couldn’t complete the event. Don’t make the same mistake I did. There are plenty of people on this blog who would love to have a few more neighbors to visit for this event, myself included. The actual episode “Treehouse of Horror XXIV” doesn’t air until October 6, 2013. If you would like to read a synopsis about the episode, check after the break. Perhaps we will see some in-game content reflective of some of these new stories. Last year, to celebrate the 24th season premiere, players were gifted a free item: the Duff Racer. If you want to know what free item we’ll be getting for the 25th season premiere, read ahead. Yay, there is a new (REDACTED) and it’s completely free! How do I get this (REDACTED) though? You’ll have to complete a three part quest called “Conventional Wisdom” that will unlock this Thursday. To summarize the “Feeding the Trolls” quest is meant to get players excited about the Treehouse of Horror update. The “Conventional Wisdom” quests are designed to get players to tune-in to the 25th season premiere of The Simpsons, which airs this Sunday at 8/7 on FOX. Anyway, here are the complete unabridged walkthroughs for these quests. If you don’t want to be spoiled further, just don’t read too far ahead. What did the update do? It’s a precursor of things to come. Garfield made me believe I should hate Mondays, but then this update happened and now I’m conflicted. So what happened anyway? Well when you start the game you automatically see a conversation take place between Homer and Lisa. To find out what is going in the game, Lisa decides to check the Tapped Out Forum… so meta! The full transcript of that conversation will be posted in a bit, but first I need to address a few spoilers from after Lisa completes her online research. The developers are keenly aware of what has been happening in the game these past few months. “Lamezino hopes it’ll be about time travel — it’s always about going back in time with them. ” Obviously this is a jab at GameZino, who claimed to be able to reset the game to an earlier time so people could get items they missed out. Of course you probably all know about the whole GameZino fiasco by now, and if you don’t check the about page, it’s filled with links to stories about that whole debacle. We also got a nod to community member spAnser with this next quote “And SpAndex had no luck this year with datamining OR datafracking.” Most of us know spAnser as the user that has been responsible for searching through the game files and posting spoilers. The Treehouse of Horror Update is coming October 1st. Are you losing interest in the game? Despite all of the recent content updates, and the upcoming season premiere next week, are you losing interest in the game? From what I could gather, it seems that most of the people who read this blog are playing update to update. Have the bi-weekly content updates sparked your interest in the game again, or are you just going through the motions? There hasn’t really been a social element to game since Whacking Day, which was earlier this year. Hopefully we’ll get something fun for the Halloween update, as well as cross-promotional stories once the new season starts. Is there anything you would like to see added to the game to make it more fun, or have all the recent updates been enough to keep you invested?